Andy Butcher has always been a “horseman”, growing up with horses and riding from a very early age. Andy also excelled in Motocross, Martial Arts, Boxing and as he got older enjoyed driving performace cars. Once he became a Registered (JISC as it was before it became the British Stunt Register) Equity stuntman, and given his passion for horses, inevitably, he decided to specialise in the equestrian side of the TV/film/stunt business. Having worked alongside many great horsemen from around the world, Andy honed his skills over many years working as a horse stunt rider, trick rider, jouster, classical rider, carriage driver and liberty trainer, laterly progressing to Horse Master for many productions in the UK and abroad. Having enjoyed working for over a decade as a self employed horseman for former top names in the industry, Andy eventually decided to start his own business working as a horse trainer and horse master. His “apprenticeship” in the business working alongside many great horse riders, stunt-men and horse masters, gave him the knowledge and ability to cope in any situation in his own right and AB Film Horses was born. Andy has three sons, who have all followed him in to the industry, working alongside their father and on many blockbusters in their own right. The team at AB Film Horses, led by Andy, have been picked for their specialist knowledge, in order to represent a wide spectrum of skills. The team have a very strong sense of professional conduct and are renowned for their ability to deliver the shot, keeping safety of the personnel and horses in mind at all times. Fully insured with excellent staff to oversee the project, nothing is left to chance. 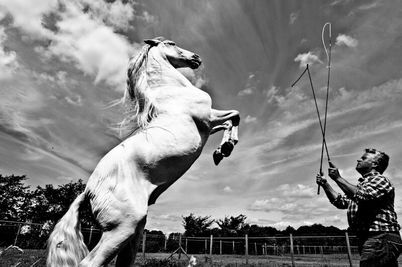 Whether you want a single horse for a photo shoot or multiples with highly skilled riders for a battle scene, AB Film Horses can provide TRAINED horses that are used to being in the busy, often noisy environment of a location, film set or studio. Reference courtesy of Leeds Castle: "If you book a specific horse doing a specific task, you will get it! If you book Andy, you will get him, not an unqualified replacement on the day!" We do not hesitate to recommend Andy, his Team and of course, his beautiful horses.